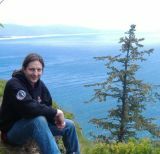 John Zunski is an up and coming author whose book Shangri-La Trailer Park I recently had the pleasure to read and review. He’s also the author of Cemetery Street and the forthcoming Nightwatching. His works run the gamut of genres, and I’ve been greatly impressed with the breadth and depth of his writerly wiles. He joins me today to talk a little about his himself and his craft. Thanks for taking the time to talk with us today, John. Without further adieu, let’s get down to business. 1) First off, why don’t you tell all the nice folks about yourself? JZ: I was introduced to the world with a pen in hand, before I could crawl I drew squiggly lines on my crib. When I could walk, I found my way to the typewriter, maybe it the noise of the keys, that rhythmic ratta-tat-tat sounded more magical than music, or maybe it was the bell that dinged after a bunch of ratta-tat-tats. Whatever it was, I found myself looking up, impatient to sit before it. When I finally did, I made lots of noise and a blizzard of scrap paper. Okay, it didn’t happen quite like that, but, I write fiction and that sounded interesting. In reality, I was anything but a prodigy. In my early years I struggled with reading, I couldn’t understand that sotp was pronounced stop or that gniht was pronounced night and that meant time for bed. Despite the confusion, something about reading seemed magical – that I could open a book and fall into another world. I wanted to be a magician, I wanted to create worlds people would enjoy. 2) And now you’re living the dream. So which authors and/or books have influenced you most as a writer? JZ: Every writer I’ve read has influenced me to a certain extent, but I cite three major influences: John Irving, Stephen King, and Carl Hiaasen. John Irving for his ability to craft intriguing characters, Stephen King because it’s about the story, and Carl Hiaasen because he makes the absurd seem plausible. The most influential books? Irving’s A Prayer for Owen Meany and King’s On Writing top the list. 3) What was your inspiration for Shangri-La Trailer Park? JZ: When I finished with Cemetery Street, I wanted to take on something completely different. So I set out to craft a story in which no one died and where despite its dark themes some laughs could be had. Unlike Cemetery Street, which was plotted with great detail, I allowed Shangri-La Trailer Park to take me where it wanted to go. 4) My irony detector went off when I first read the title of the book. Care to elaborate on how you settled on this title? JZ: It was a long ago Saturday Night and I was visiting friends who lived in a trailer park. One friend used Shangri-la during the course of conversation. In my writer’s mind, I connected the dots and had the title long before I had a story. After completing Cemetery Street I knew Shangri-la Trailer Park was on deck – I just hadn’t a clue about its story arc. 5) Funny how a few words of happenstance can lodge in your brain like that, huh? I get the sense from your bio that this novel is at least a little bit autobiographical. Is that the case? JZ: You calling me Trailer Trash? What the #$%$ is your problem? Just kidding. The general answer is a resounding no, with the exception a handful of minor occurrences. This first instance ties in with the Native American influence. The Browning tourist episode is an embellishment of an incident during my first visit to Montana. I was checking out of a motel in Browning, when I called the elderly man behind the counter Chief. The air went out of the room and I was stared down by numerous people. At the time, I called everybody Chief and it never occurred to me that it is a racial slur. Bear spray made its way into the story in part because a friend accidentally discharged a can in my home. I was unlucky enough to catch a good chunk of it with my face. The description in the story is first hand experience. The Montana/PA connection. When I began the manuscript I was living in PA, when I finished I had moved to Montana. 6) Bear spray is no joke, man! But then again, it was all in the name of art, so I guess it was a worthy sacrifice. Switching gears a little bit—what do you hope your readers will take away after reading this book? JZ: A memorable story and a desire to explore all of my writing. Each novel is unique and as a collection can’t be lumped within a single genre. As I mentioned Cemetery Street is a coming-of-age tearjerker; I consider Shangri-La Trailer Park a ‘dramady’, and the forthcoming Nightwatching is a ghost story. 7) Of all the characters in the book, who do you identify with most? JZ: Would you believe me if I told you none of them? When I write a character I am that character, but when I’m out of writing mode, I don’t identify with any of them. 8) Makes sense to me. I’m the same exact way when it comes to what limited writing I’ve done. Now, Shangri-la Trailer Park has quite a few scenes depicting violence against women, albeit not gratuitous (in this readers opinion) and always well within the context of the story. Did you have any qualms about including it in the book, perhaps regarding how it might be received by a reader? JZ: You bet I did. From the writing perspective, I’ve learned that when I touch on something that elicits a personal reaction, I know I’m onto something; I take a deep breath, hold it and continue down that path, trusting the muse will not lead me astray. That being said, the scenes are designed to demonstrate the perpetrator’s psychotic tendencies and allow the reader to build anger and resentment towards him. It’s not enough to tell the reader of Ace’s character, it needs to be shown. My major source of angst is alienating those who have read Cemetery Street and are expecting Shangri-La Trailer Park to be similar. That being said, they are similar in that both will test readers - Cemetery Street will try a reader’s heart; Shangri-La Trailer Park will try a reader’s mores. I know that Shangri-La Trailer Park will alienate some readers who enjoyed Cemetery Street, but that’s the reality I have to face if I want to maintain the integrity of my craft. If I can’t shoulder that burden, I’d be better off selling balloons at the circus. 9) Native American lore factors greatly into the book, and, pardon me for saying so, "Zunski" doesn't sound very much like a Native American surname. So if you're not Native American yourself, how did you become interested in Native American culture enough to include one as your main character? JZ: I have been mistaken for Native American, especially when I wear a tan. The funniest instance occurred in a restaurant when I felt a tap on a shoulder. I turned around to see a four year old boy staring me in the face. In his tiny voice, he asked: “Excuse me sir, did you just finish dancing at the Pow-wow.” His parents were mortified; my wife and I got a good laugh. I’ve always enjoyed Native American mythology and after a fateful vacation to Montana I became enamored. It didn’t take long before I imagined how the ruggedness of the Rocky Mountains impacted the region’s ancient inhabitants. Such impact naturally parlayed itself into my writing. As with every story I conjure, I immerse myself in a topic that I know next to nothing about and try to master it well enough to tell a convincing story. 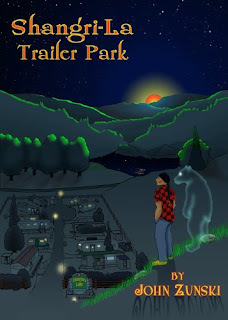 Many long nights were spent pouring over Blackfoot legends to find myths that fit Shangri-La Trailer Park. 10) Well it was time well spent, I can tell you that much. Finally, what is it that keeps you writing? The life on a writer isn't an easy one, so what motivates you to keep putting pen to paper? JZ: My head would explode if I didn’t. Stories are constantly scratching and clawing within my mind. I’ve also been blessed with incredible voyeuristic opportunities and feel it would be a waste of a gift if I didn’t mesh what I’ve witnessed with the nature urge to concoct a story. Well that about does it. Thanks, John. It’s been a really intriguing discussion. I hope to hear more from you in the future. JZ: Thanks for having me and taking the time to read and review Shangri-La Trailer Park. Hopefully we can chat again. You bet. And I’ll definitely be looking forward to the release of Nightwatching. Copies of Shangri-La Trailer Park can be purchased to the tune $1.99 at Amazon and Barnes & Noble (a steal if you ask me). Even more of a steal is the giveaway we've got going on right now. Two copies of Shangri-la Trailer Park are available, so take a look at my review and enter for a chance to win. This was excellent. Nicely written and just enough of John's style showing through to convince readers that his voice is one they'd like to read more of. May you never finish dancing at the Pow wow. Thanks, Dixie. All of the credit goes to John. He's a great interview subject who can talk interestingly about a great many subjects. Another interesting interview. John's sense of humor always comes through loud and clear.